It&apos;s Fall, the best time of year for a hike, and the Loudoun County countryside spans from the Blue Ridge Mountains to the Piedmont Valley to the forested banks of the Potomac River. As co-authors of the new guidebook 60 Hikes Within 60 Miles of Washington DC, we chose three hikes in Loudoun that capture these diverse landscapes. To help you plan your next outing, consider these three hikes where you can escape from your busy life and enjoy some healthful exercise. Scientists have proven people feel significantly better when they spend time outdoors. Nature makes us more creative and reduces anxiety. 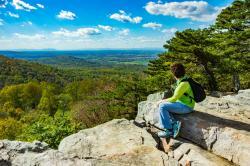 So, you lucky Loudoun dwellers, get out and hike! Algonkian Regional Park, part of the Potomac Heritage National Scenic Trail, contains an easy 2.8-mile loop hike with an abundance of wildlife viewing. As you follow the banks of the Potomac River, and then hike into Algonkian Park’s forested sanctuary, you’ll join Virginia’s Birding and Wildlife Trail. Algonkian is a thriving habitat for songbirds, dragonflies and butterflies. The wildflower meadow that blooms in the spring contains the oldest bluebird nestbox trail in the region. During the Fall, as the foliage changes to gold and ginger, keep an eye out for herons, king fishers and eagles. 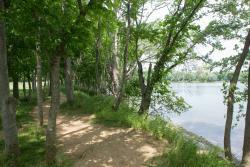 Algonkian Park has both paved and natural surface hiking trails and is located in Sterling. Ravens Rocks is on a steep, rocky section of the Appalachian Trail. Near the border of Loudoun and Jefferson County, West Virginia, this 5.2-mile hike has 1,500 feet of elevation change, making it a moderately challenging out and back hike with a big payoff—panoramic views of the Shenandoah Valley and Blue Ridge Mountains. The hike begins at a Trailhead off of Pine Grove Road (at the intersection of Route 7) in Bluemont, Virginia. It makes several steep switchback descents and involves some scrambling over large boulders and mossy rocky terrain. We encourage hikers to wear sturdy footwear, and carry a walking stick if you like the support and stability. The views from this hike will impress your Instagram followers. Be sure to tag #LoveLoudoun! Banshee Reeks Nature Preserve near Leesburg is a 775-acre park run by volunteers and owned by the Loudoun County Department of Parks, Recreation and Community Services. Part of the Piedmont region of Virginia, the lush landscape here is reminiscent of rural England with villages, farms, vineyards, and churchyards set on rolling hills and valleys. This family-friendly 3.5-mile hike offers a variety of scenery. Banshee Reeks Visitor Center has museum-quality specimens of local flora and fauna as well as a Honeybee display with a visible hive and a collection of taxidermy and animal bones. 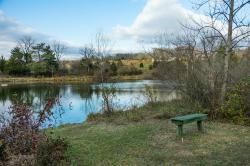 Expect to see some grazing goats, an 1830&apos;s log cabin and bank barn on the property. Be on the lookout for the many birds of prey, like owls and raptors, that call this park their home. This park is only open on weekends. Renee Sklarew and Rachel Cooper are freelance writers covering the greater Washington, D.C. region. They just co-authored the recently released book 60 Hikes Within 60 Miles of Washington DC available for purchase here.